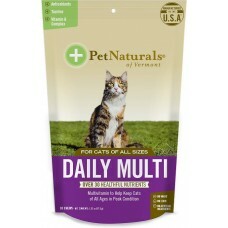 To help your cat maintain peak condition throughout his life, offer him a delicious little chewable multivitamin like Daily Multi. 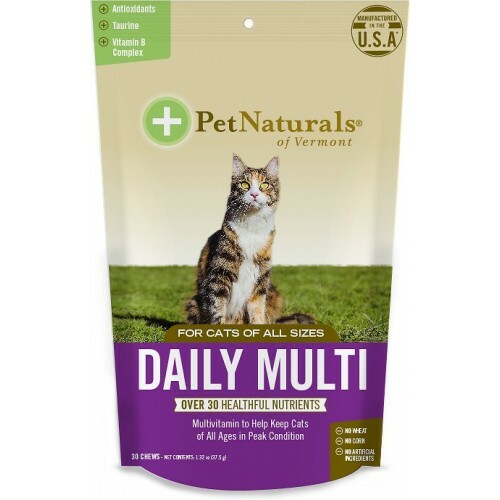 It provides over 20 healthful nutrients for cats of any age, including a vitamin B complex, antioxidants and minerals, and taurine to support your cat’s immune system and healthy eye function. Oat flour, brewers dried yeast, rye flour, fish meal, glycerin, arabic gum, calcium phosphate, safflower oil, canola oil, soy lecithin, fish oil concentrate, maltodextrin, sodium alginate, calcium sulfate, calcium carbonate, water, taurine, l-ascorbyl-2-polyphosphate, citrus pectin, l-arginine, vitamin E supplement, potassium chloride, ferrous sulfate, zinc sulfate, dl-methionine, niacinamide, sorbic acid (a preservative), magnesium oxide, vitamin B12 supplement, inositol, thiamine mononitrate, sodium selenite, d-calcium pantothenate, riboflavin, propionic acid (a preservative), vitamin A supplement, copper sulfate, manganese sulfate, mixed tocopherols (a preservative), pyridoxine hydrochloride, vitamin D3 supplement, biotin, folic acid, calcium iodate.